DiStefano Jaud Architecture Named As Finalist for the 10th Annual Thompson Okanagan Kootenay Commercial Building Awards. Kelowna architects Carlo DiStefano and Neil Jaud were named as one of the Finalists for the 10th Annual Thompson Okanagan Kootenay Commercial Building Awards for their Geometrik building design. The prestigious award ceremony will be held on Thursday, September 20, 2018, at the Coast Capri Hotel in Kelowna, in sponsorship with the Southern Interior Construction Association, RE/MAX Commercial, Black Press and MNP LLP and the Green Sheet Construction Review. The Annual SICA Thompson Okanagan Kootenay Commercial Building Awards were founded to recognize the efforts of Thompson, Okanagan, and Kootenay regions’ new institutional, commercial, industrial building, multi/single family, recreational or renovation projects located from Kamloops to Osoyoos, and from Revelstoke to Fernie. The nominated DiStefano-Jaud design features warehouse space and the company headquarters. The impressive design encompasses Geometrik’s signature outlook towards acoustics illustrating the movement of sound by organizing building elements, along with DiStefano-Jaud’s hallmark functionality of space and design. 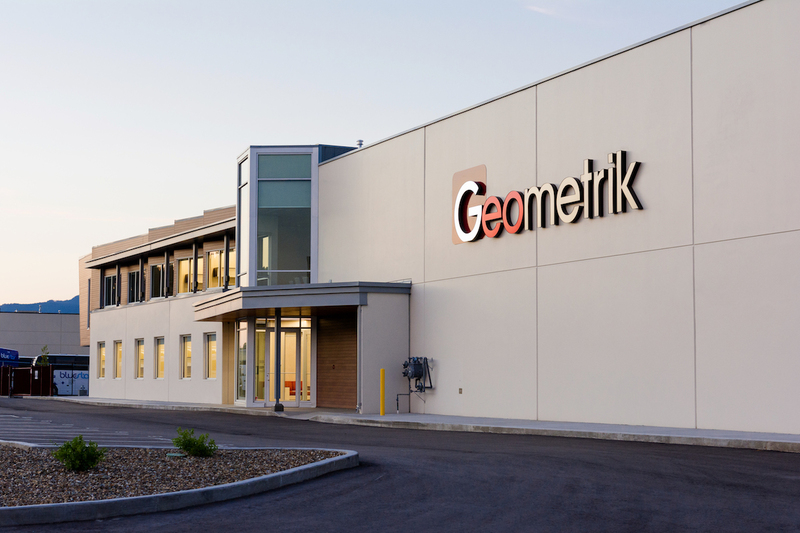 Geometrik’s new West Kelowna office and warehouse are located at 1449 Velocity Street, Kelowna BC. Architects in Kelowna BC, DiStefano Jaud Architecture specializes in services for commercial projects of different sizes, from renovations to large developments. Upon receiving the news of their nomination, the spokesperson for DiStefano-Jaud said, “We believe in working closely with our clients and creating a comfortable setting for them to exchange their ideas with us as we build a design of shared ideas in team fashion to create the optimal solution for our clients.” DiStefano-Jaud are thrilled to be recognized as one of the Best Architects in Kelowna for commercial projects, this acknowledgment has inspired them to keep up the hard work. Geometrik is the only custom manufacturer of high-quality wood acoustical ceiling and wall panels on the west coast of Canada. Located in Kelowna, B.C., near the U.S. border, Geometrik offers a unique combination of experience, engineering expertise, and manufacturing capability. Their highly motivated team of skilled workers and artisans carefully craft acoustic paneling to exacting standards that are the hallmark of Geometrik, giving the ultimate in sound control and beauty. As wood manufacturers, Geometrik is committed to innovation and quality, utilizing the best materials, hardware, and the latest construction methods.